Wedge Holdings: Experience TCG "Haikyu!! Volleyball Card Game!!" 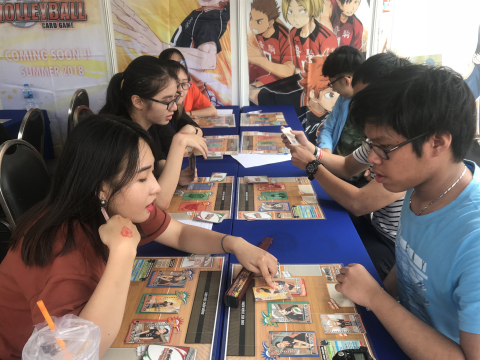 in Vietnamese at "NATSU MATSURI"
On 12 - 15 July 2018, Wedge Holdings Co., Ltd. (JASDAQ:2388) (Headquarters: Chuo-ku, Tokyo, Managing Director and CEO: Mr. Tatsuya Konoshita) held a Trading Card Game (Below written as TCG) event called “NATSU MATSURI” at Ho Chi Min, Vietnam. On that event, we introduced “Haikyu!! Volleyball Card Game! !” in Vietnamese. This event was for fans to enjoy their favorite anime or manga characters in costume, as well as place to sell goods and events on stage. Many Vietnamese joined this event. In our booth, visitors had a chance to play “Haikyu!! Volleyball Card Game” in Vietnamese and get prizes from lottery. There were 1,200 visitors at our booth, with 130 people trying “Haikyu!! Volleyball Card Game” in Vietnamese, and 500 goods flyers were distributed. On Facebook, the post regarding our lottery was shared 229 times and reached up to 8,700 people. As already announced, we will start selling TCG “Haikyu! Volleyball Card Game” in Vietnam which will be followed by other countries in Southeast Asia. We will continue to act as the bridge for contents holders and users, as well as to boost entertainment contents industry through such events. * “Haikyu!! Volleyball Card Game! !” is a TCG released by Tomy Company, Ltd. under trade name “Haikyu!! Vobaca! !” for domestic use. The card game introduced in this event was translated in Vietnamese.